We have exciting news to share related to Non-Employee and Independent Contractor Travel. Come see the latest changes. There will be a quick uShop update also. Please join us on Wednesday, April 3rd at 9:00 AM in Cameron Hall Room 105. If a state employee (any traveler) chooses to use a personal vehicle, actual mileage is reimbursable. Mileage is measured from the closer of duty station or point of departure to destination (and return). A state employee (any traveler) shall be reimbursed the business standard mileage rate set by the Internal Revenue Service (58 cents per mile effective January 1, 2019) when using their personal vehicle for state business when the round trip does not exceed 100 miles per trip. For business travel trips that utilize personal vehicles and the round trip exceeds 100 miles per trip, the traveler shall be reimbursed at a rate that would not exceed 33 cents per mile for the entire mileage. Reimburse for use of personal vehicles on a limited basis in situations when the use of state owned vehicles or state term contract rental vehicles (i.e. Enterprise) are not readily available. All faculty/staff traveling on international university business have the option of purchasing international travel insurance before the trip. Contact the Institutional Risk Management Office at extension 2-5974 and they can explain to you the differences between the regular state plan and th special coverage for international travel. U.S. Citizens traveling abroad should register their travel through the Department of State's https://Smart Traveler Enrollment Program. In addition to receiving updates on travel alerts and warnings, you can receive assistance in situations ranging from replacement of lost passports to evacuation during natural disasters. When entering the Report Name in the Pre Approvals and the Expense Reports, please enter only letters and numbers. Banner has difficulty recognizing characters other that the letters and numbers. Please if you have any questions regarding this contact Sandy Gladden in the Chrome River office at 962-4217 or gladdens@uncw.edu. Chrome River Welcome Page has a new section which should be viewed daily for any system updates or important information. The Delegates will start receiving an email notification for Unused Firm Paid Items (credit card charges in the eWallet). In the past only the Expense Owner received this notification. 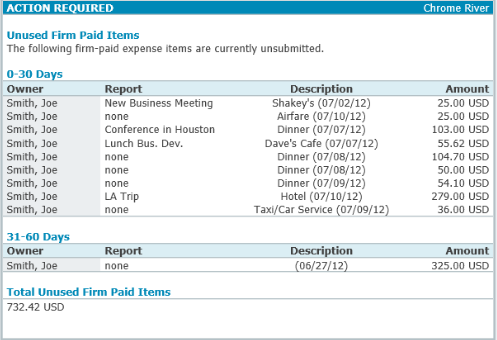 All Date Fields on the Pre-Approval and Expense Reports will need to be manually filled in. One exception is on the Pre-Approval Header page where the current date is still being populated. Please change to the correct travel dates. Also, a reminder that when entering Invoices in an AP Check Request please use the date of the invoice. Report ID and Status are now displayed on Draft, Returned, and Submitted Dashboards. Users now have the ability to email receipts to the eWallet of another user by entering his or her email address as the subject of the email. The sender will receive an email confirmation that details who the image was sent to. For example, if User A snaps a photo of a taxi receipt on behalf of User B, User A simply forwards it to receipt@chromefile.com with User B’s email address as the subject line. User B will then see the receipt in their eWallet the next time they log into Chrome River. Note that the receipt must be sent from a user’s primary or alternate email address stored in Chrome River, and the subject line must contain an address that is the other user’s primary or alternate email address in Chrome River. And both users must work for the same Chrome River customer. As many of you might have noticed there has been a problem with some Pre-Approval expiring prematurely in Chrome River over the past few months. The Chrome River team is working to resolve the issue. To prevent any further Pre-Approvals from expiring prematurely we will be turning off the rule that automatically expire any pre-approvals that are 90 days past the end date of the trip until they can get the problem resolved. If you need a Pre-Approval to be closed or liquidated please contact Caitlin Osgood at osgoodc@uncw.edu. If you have any questions regarding this situation please contact Sandy Gladden, Chrome River Supervisor at gladdens@uncw.edu. Enterprise Rental Car Agency has launched a new booking tool called EHI Direct. University employees wishing to rent a vehicle are required to create a user profile through EHIDirect by contacting Kellie Smith smithkr@uncw.edu or Sandy Gladden gladdens@uncw.edu. Do not register for free online. Once you have a profile established under UNCW, you are ready to book reservations through EHIDirect. Please note, the EHIDirect system is to be used for vehicle rental reservations only; employees who are traveling for University business purposes should not utilize the flight or hotel reservation functions in EHIDirect. The EHI Direct Help Desk at 855-573-0012 or EHIDirectSupport@ehi.com. UNCW’s Account Manager, Nina Gladysiewski at Nina.M.Gladysiewski@ehi.com. Per the NC Office of State Budget and Management the per diem policy has been changed beginning January 1, 2018. For day trips no meals will be allowed to be claimed for reimbursement. To receive reimbursement for meals the trip must include overnight travel and be more than 35 miles from your duty station. On the day that you leave for an overnight trip the lunch time has changed. Now if you leave by noon for an overnight trip you will be eligible to claim lunch. Please contact the Chrome River Team if you have any questions. The following list details the new rates of subsistence per day for travel related expenses. Register Now for Travel Card Training! To learn about your responsibilities for a Travel Card, you can sign up for one of the Travel Card classes offered by the Travel Office. All Card Holders and delegates must attend Travel Card Training before the card will be issued. To register for the Travel Card training session, please follow instructions found here. This link will bring you to the Finance Training registration site. Deadline for travel check run is Friday at 10:45 a.m. for a check/direct deposit the following Friday.